The 28th Infantry Division marching in front of the Champs Elysee in Paris, France. August 29, 1944. Mustered into federal service in February 1941, Pennsylvania's 28th Division saw its first action in the hedgerows of Normandy in July 1944. 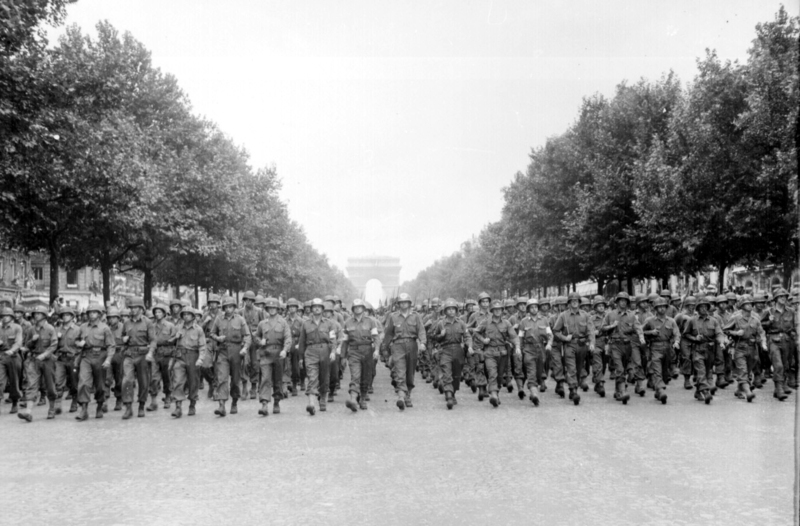 Nicknamed the "Bloody Bucket" Division by its German foes, the 28th pushed through France, Belgium, and Luxembourg, and in September 1944 became the first American division to enter Germany. The 28th suffered heavy losses during the Battle of Huertgen Forest and then took the brunt of a brutal Nazi counterattack during the Battle of the Bulge in December 1944. Deactivated in 1945, the Division was reconstituted in the Pennsylvania National Guard in 1946.